A hidden gem no more...Sleeping Bear Dunes National Lakeshore made CNN Travel's list of 20 can't-miss-U.S. beaches, and has also been named "The Most Beautiful Place in America" by the viewers of ABC's Good Morning America. And the pictures you've seen do not even begin to describe the splendor of this natural wonder formed by glaciers and located within Leelanau and Benzie counties in northwest Michigan. Boasting 35 miles along Lake Michigan, two islands and 21 inland lakes, this national park brings in over a million visitors every year. A fall color tour along the famous M-22 will bring you right up to the national park. The sand dunes that peak at over 400 feet offer spectacular views over the lake and neighboring communities of Empire and Glen Haven. 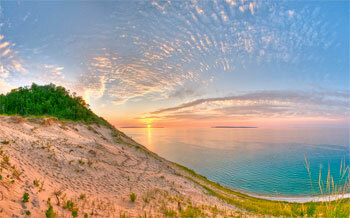 This is a must-see for any visitor to Sleeping Bear Dunes National Lakeshore. Pierce Stocking was a lumberman who loved nature...especially the view from the bluffs. He wanted to share this beauty with the public, and began construction of a road in the 1960s. By 1977 it became part of the National Park. The Scenic Drive starts north of the Visitors Center and is off M 109. Along the seven-mile drive, you will be treated to some of the most beautiful sights one can imagine, including stunning views of Lake Michigan. Drive or ride your bike (expert level cyclists only); there are two picnic areas available with restrooms. You must stop at the Lake Michigan overlook (at parking lot #9) and walk to the observation deck, which sets 450 feet above the lake level. This is the greatest view of all, so plan to spend some time here and enjoy the serenity of this majestic place. The Dune Climb is eight miles north of Empire off M 109. Only for the most physically fit, climbers are rewarded at the top with views of Glen Lake. There are three hiking trails in this vicinity which offer various degrees of difficulty...Dunes Trail (3.5 mile difficult), Loop Trail (2.8 mile moderate) and the Duneside Accessible Trail (1.8 mile easy) with is handicapped-accessible. 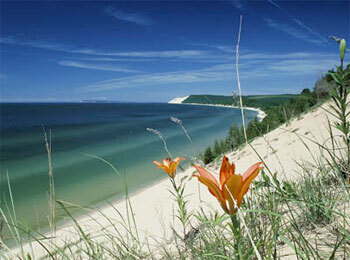 Also see www.LakeMichiganSandDunes.com for info about more Lake Michigan Sand Dunes!